Easy Care for — Dog Ear Infections — Hot Spots — Horse Scratches — Rain Rot — Fungus — Dog Ringworm — Cat Ringworm — White Line Disease — Cuts — Thrush — Cat Ear Infection & More! Banixx is a fast-acting, affordable aid in the recovery of every kind of bacterial and fungal infection. Acclaimed as a ‘Product of the Year’ by the notable Horse Journal because: “It does what it claims to do”, “results are clearly superior” and “what our testers have found they simply wouldn’t be without again”. While Banixx® is a powerful anti-fungal and antibacterial agent, it is also extremely tissue-friendly and clinically proven harmless around the eye. Successfully used on horses, dogs and puppies, cats and kittens, parrots, falcons, llamas, ferrets, alpacas, show cows, sheep, pigs, reptiles and even a one-month old foal. Banixx® is odor-free, non-staining, sting-free, non-toxic, steroid-free, antibiotic-free, and does not contain alcohol or tea tree oils. 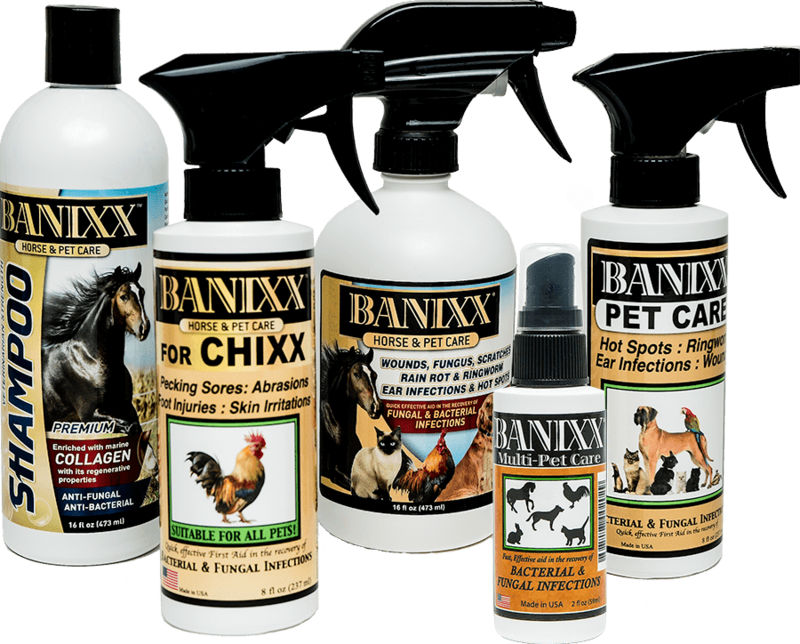 Banixx has proven itself to be the #1 choice of horse and pet owners. With its high level of efficacy and unrivaled affordability, it is easy to see why Banixx Horse & Pet Care was selected as a Product of the Year by Horse Journal.